Certified Safes Ireland™ is a trading name of Certified Safes International Ltd™ and is one of the most professional and respected safe suppliers and installers in Europe. Our team of technicians, engineers and consultants are both professional and highly qualified. Certified Safes International Ltd™ is a longstanding member of The European Security Systems Association and part of the ICS Group of companies. 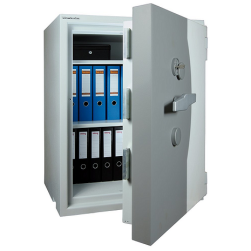 Certified Safes Ireland's primary focus is in providing genuine European accredited safes, data safes, fire protection units and vaults which will maintain their insurance recognition over time to provide long term security and peace of mind. Fraud and misrepresentation are widespread in the safe and vault industry in Ireland and worldwide. 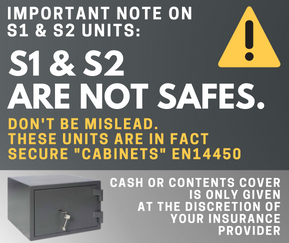 In fact only a small percentage of units described as “safes” worldwide have ever been tested by an accredited test house yet most safe manufacturers make “recommendations” as to the cash value their products should be covered for by insurance. Needless to say the vast majority of these “recommendations” have no basis in reality. Alan Donohoe Redd is managing director and chief consultant with Certified Safes International™ Ltd, and Safe And Vault Locks Ltd which is a European Sargent And Greenleaf safe and vault lock distributor. With over 34 years experience in the safe and vault industry Alan has worked with major organisations within banking, law enforcement and defence in Ireland, UK, Europe, the U.S. and the Middle East, designing systems for the protection of data, documents, weaponry, cash, art, and gold bullion. 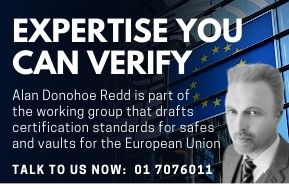 Alan is a member of the Security Institute of Ireland and a current National Standards Authority of Ireland expert sitting on European CEN committee 263 that drafts European safe and vault standards for the European Union. Alan is convenor of the Irish Safes Ratings Group (ISRG) which works closely with The National Standards Authority of Ireland, The Private Security Authority, The European Security Systems Association (ESSA), ECB-S certification and An Garda Síochána. Alan has also been sitting on the Private Security Authority of Ireland working group for locksmith and Safe & Vault licensing. There is no higher level of expertise when it comes to the subject of certified safes, vaults and associated locking systems in Ireland. Alan’s expertise has been relied upon by clients such as; The U.S. Air Force (Europe), PayPal (Worldwide), Grant Thornton, Irish Permanent Representation to EU (Bruxelles), The Danish Defence Forces (Afghanistan), Isle of Man Gold Bullion, The Insurance Institute of Ireland, The Private Security Authority, Brown Thomas, The Royal College Of Surgeons, BFC Bank, Interxion Data Centres, Druids Glen and The Shelbourne among many others …. A Deposit Safe is an essential element in many retail businesses, as an anti hold-up measure and increasingly as part of a cash tracking system. Unfortunately this type of safe is also one of the primary safe types where fraud and misrepresentation occur. The reason for this is simple. 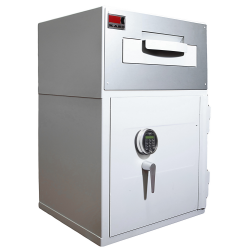 As a properly certified deposit safe incorporates a deposit system, testing and production of these units is obviously more expensive than for a regular safe. This increase in cost provides ample temptation for unscrupulous safe suppliers to fit their own DIY systems to a certified non-deposit safe and try and pass it off as a genuine tested and certified deposit safe. The drawer deposit safe is the only current safe deposit system design for deposit safes that has accredited European certification. This deposit safe drawer is certified EN1143-2 however not all deposit safes in this design have passed accredited testing. Always look for an accredited EN1143-2 certification badge on any deposit safe type. Fishing contents from a letter slot deposit safe without any sign of entry is very easy using a variety of methods. The EN1143-1 safe and vault standard states that an opening in the safe cannot be more than 10mm in circumference. Rotary drum deposit drums are almost always fitted by safe suppliers themselves. Whether fitted by safe suppliers on in a factory this deposit type makes fishing of contents easy as well as the overall unit quite venerable due to the huge hole in the safe barrier material into which the drum fits. Usually these drums are fairly easy to remove from any safe. Fishing contents from a capsule deposit safe without any sign of entry is very easy using a variety of methods. A vacuum with a tube attached is probably the easiest method. The EN1143-1 safe standard states that an opening in any safe cannot be more than 10mm in circumference. Fishing contents from an under floor capsule deposit safe without any sign of entry is very easy using a variety of methods. A vacuum with a tube attached is probably the easiest method. 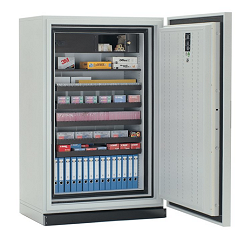 The EN1143-1 standard for these safes state that an opening in the safe cannot be more than 10mm in circumference. NO UNDERFLOOR SAFE OF ANY KIND IS CERTIFIED. Fishing contents from a pneumatic capsule deposit safe without any sign of entry is very easy using a variety of methods. A vacuum with a tube attached is the easiest method and very quick. We have removed capsules from a pneumatic deposit safe ourselves using this method in less than twenty seconds. Pneumatic deposit safes, capsule deposit safes and envelope deposit safes are all highly vulnerable to this kind of fishing and manipulation. At Certified Safes Ireland™ we are unrivalled in expertise and experience when it comes to the protection of digital media and documents from Fire, water, explosion and electromagnetic risks. We have provided fire and burglary resistant data safe solutions for forensic labs, military applications, aircraft manufacturing and bio-technology protecting media such as micro-processors, hard drives, flash drives, and a wide variety of magnetic media. Certified Safes Ireland™ are a nationwide and international supplier and installer of safes. We export Worldwide through our parent company Certified Safes International™.